The magnificent The Golden Age of Rock'n'roll and All the Way from Memphis remain rollicking, rambunctious glam-rock anthems, alive to their own glory and absurdity, while All the Young Dudes and Roll Away the Stone are roustabout encore gems. 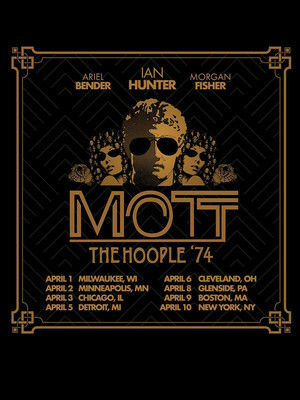 Why See Mott The Hoople? 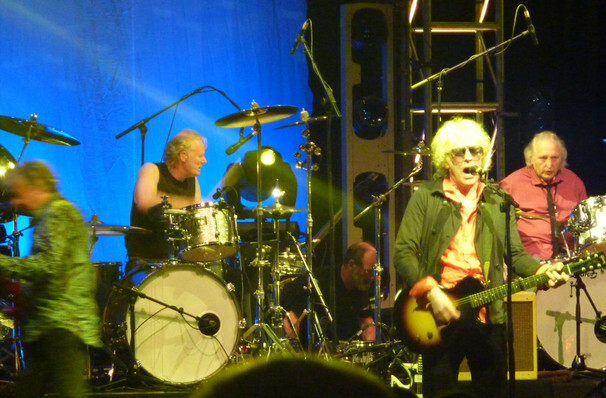 They may not be the 'young dudes' they used to be, but Mott The Hoople are very much alive and still rocking! In the Spring of 2019, the celebrated British classic rock icons will embark on their first North American tour for the first time in 45 years, commemorating the 45th anniversary of the legendary 1974 US tour, which featured Queen as an opening act, as well as the release of their last two albums 'Mott' and 'The Hoople'. For eight special nights only, core members Ian Hunter, Ariel Bender and Morgan Fisher will resurrect MTH's glorious past with live renditions of seminal hits like 'All The Young Dudes', 'The Golden Age of Rock and Roll' and 'All The Way From Memphis'. Arguably one of the most beloved glam rock outfits of the 70s, Mott The Hoople has reformed on rare occasions but only ever played in their native UK. Formed in 1969 and named after the eccentric Willard Manus novel, the group remained underground heroes, never fully breaking into the mainstream but retaining a dedicated and fanatic fan base and remaining a major influence on other bands including Def Leppard, Oasis, REM, Motley Crue and The Clash. Blurring the lines between genders, the make-up toting Mott The Hoople reprobates conjured raucous rock magic with flaming guitar riffs, bluesy grit and subversive lyrics. Sound good to you? Share this page on social media and let your friends know about Mott The Hoople at The Chicago Theatre. This is an independent website not affiliated with the venue. 'The Chicago Theatre' as well as all associated graphics, logos, and/or other trademarks, tradenames or copyrights are the property of MSG CHICAGO, LLC and are used herein for factual descriptive purposes only. This website is in no way associated with or authorized by MSG CHICAGO, LLC and neither that entity nor any of its affiliates have licensed or endorsed us to sell tickets, goods and or services in conjunction with their events. The term Mott The Hoople as well as all associated graphics, logos, and/or other trademarks, tradenames or copyrights are the property of Mott The Hoople and are used herein for factual descriptive purposes only. We are in no way associated with or authorized by Mott The Hoople and neither that entity nor any of its affiliates have licensed or endorsed us to sell tickets, goods and or services in conjunction with their events.